Are Your Fields Ready for Customers? 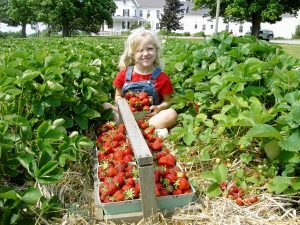 A few ripe berries can be found in southern Maine this week. Most growers are expecting the start of the harvest season to be about a week late. Pest pressure was again very low this week, and many fields are now beyond the bloom stage when clipper or tarnished plant bug can cause significant injury. Mites and both foliar and fruit rot diseases still have the potential to become problems, so growers should continue monitoring for symptoms, and protecting late flowering varieties with fungicides if wet weather persists in the coming days. 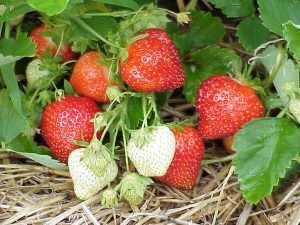 The Strawberry IPM Newsletter will take the next couple of weeks off and return with the annual renovation issue in July. 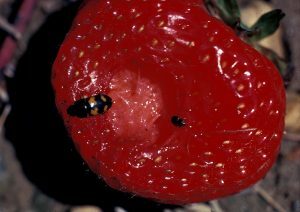 Strawberry bud weevil or “clipper” is no longer a threat for strawberry fields in southern and mid-state regions, as few flower buds remain for them to infest. No fresh injury or clippers were found in the fields scouted this week. However, you should continue to scout for clipped buds if you still have late varieties that are flowering. Tarnished plant bug activity continues to be very low. We have seen occasional adult bugs in the fields, but no nymphs were found this week. However, with the warmer, drier weather forecast, and more fields coming into bloom, fields should be scouted regularly and often for both adults and nymphs. The control threshold for nymphs is 4 or more flower clusters infested per 30 sampled. Two-spotted spider mites were found over the spray threshold (25% infested leaves) in just one southern field this week. While mites have been generally low this spring, it is important to keep scouting for them through the summer to prevent heavy populations from building up and weakening the plants as they set up fruit buds and prepare for the winter. Sap beetles: Growers should keep an eye out for damage as the berries start to ripen. The 1/8 inch-long, dark brown beetles chew small holes in ripening fruit, similar to slug injury. They may be found in the holes they’ve chewed, but often drop to the ground when disturbed. The best management strategy for sap beetles is good sanitation. 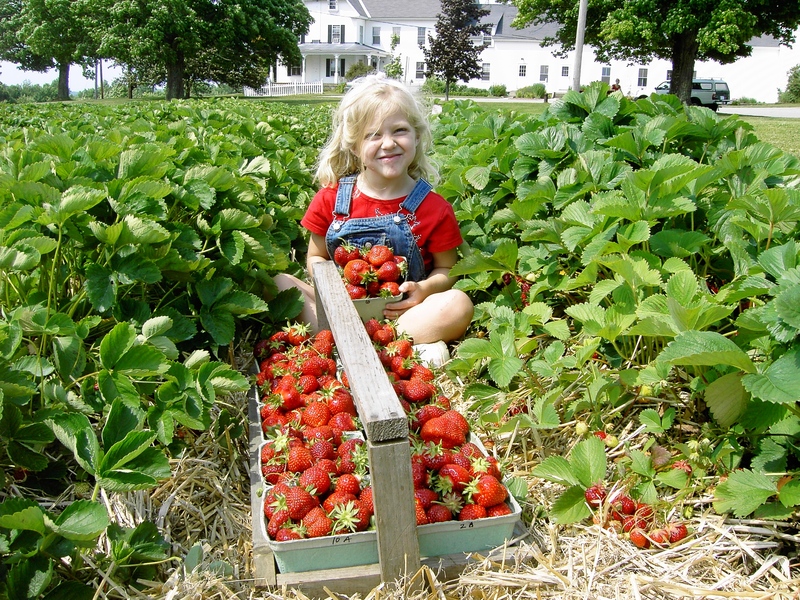 Keep the field free of overripe fruit by picking often and thoroughly. Insecticide sprays for this pest can be effective, but should be a last resort during the harvest period. Assail®, Brigade®, Dibrom® and PyGanic® are registered for control of sap beetles with pre-harvest intervals ranging from 12 to 24 hours. Read the product label carefully for this and other application instructions and restrictions. Birds, especially cedar waxwings, are moving into fields to feed on ripe fruit. Only by keeping a near constant presence in the field and eliminating roosting sites can you reduce the damage. Some chemical repellents containing methyl anthranilate (e.g. Avian Control®), are registered for use on strawberries. Although most scientific studies with these products have not found them to be very effective, some growers have claimed good results. Remember that songbirds are protected by law and should not be killed. However, permits may be issued for killing birds by the U.S. Fish and Wildlife Service if they receive a recommendation for such a permit from the Maine Wildlife Services Office (part of the USDA Animal and Plant Health Inspection Service) in Augusta, along with an application from the grower. There is a $50 fee for the application, and it may take over a month for the permit to be processed. However, the permit is good for one year, so if you have problems this season, you may consider applying for a permit this winter, which would allow you an option to kill birds, if necessary, next season. The Wildlife Damage Office has recommendations for managing birds in crops, and also has some control options available through their office. For more information on permits or bird control contact the office in Augusta at 207.629.5181. The office is located in the Capital West Business Center at 79 Leighton Road in Augusta. Powdery mildew: We’re starting to see more fields with early indications of powdery mildew. Look for upward cupping of the leaves and reddish streaking or lesions on the leaf and flower stems. Consider using a fungicide that will control powdery mildew, such as captan + Topsin-M®, or Pristine® if you’re still spraying for gray mold. Those very close to harvest may want to wait until renovation after harvest to initiate a control program. 2017-2018 New England Small Fruit Management Guides now available. Copies can be purchased through UMaine Extension at Highmoor Farm. Cost of the guide is $12.00 plus $2.63 postage for a total of $14.63. Please send checks made payable to UMaine Cooperative Extension and mail to: Highmoor Farm, P.O. Box 179, Monmouth, Maine 04259, attention Pam St. Peter. For more information, contact Pam St. Peter at 207.933.2100 or pamela.stpeter@maine.edu.